DSI CC Implant is the result of an endless pursuit for an exceptionally high-level product that is simple, easy-to-use and offers enhanced functionality, performance, and aesthetics. DSI CC Implant combine the original tapered implant body with a tight seal interlocking conical connection hexagon. This offers the best aesthetic solution for all indications. The implant body designed to mimic the shape of the natural tooth root and ensuring high initial stability for all loading protocols, including immediate loading of the implant. DSI CC Implant features built-in design characteristics that provide biological benefits for hard and soft tissues and promotes esthetic results. The unique biologic and mechanical features of the implant encourage bone regeneration and greater volume of bone; supporting highly stable surrounding soft tissues and more esthetic restorations. DSI CC implant is a Specially designed implant with high primary stability in demanding situations, such as soft bone or extraction sockets. Compatible with Nobel Active and similar conical connection systems like DESS, Implant Direct, ADIN A.B etc. The anatomy - matching converging coronal shape and platform switch ability optimize bone and soft tissue volume and prevent a future regression. A double progressive divergent thread which slices and gradually compressing the bone as it progresses from the neck area. more strength and stability in demanding situations, such as extraction sockets, poor bone quality, and immediate loading. Variable height level blades are increasing the implant surface and allowing to achieve a reliable primary stability even in a soft bone. Reverse-cutting flutes with drilling blades become increasingly aggressive and sharp at the third coil from apical end, thus offering excellent primary stability. Experienced clinicians can benefit from the possibility to adjust the implant position during placement for an optimized restorative orientation. 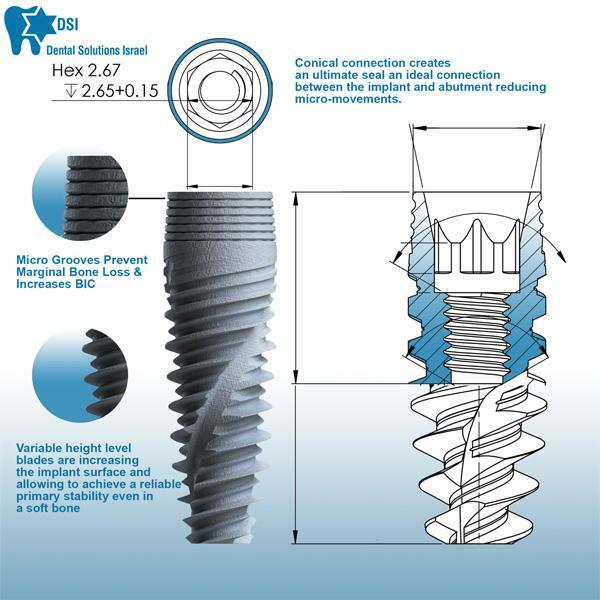 Conical connection creates an ultimate seal an ideal connection between the implant and abutment reducing micro-movements. Micro-rings on the neck of the implant assist in reducing bone stress and bone resorption and increase BIC. The surface roughness and micro-morphology is a result of sandblasting and acid etching. This proven surface technology provides excellent osseointegration resulting in long-lasting clinical success. All of DSI implants are SLA treated. (Sandblasted and acid etched). SLA has been proven successful over the years, eliminating various contaminants. Furthermore, it maintains high stability during the healing process and promotes long-term success. The conical connection implant system offers Regular and Narrow platform. The Regular Platform RP (4.3/5.0) is designed for posterior cases which require a wider base. The Narrow Platform NP(3.5) Is designed for the anterior area where space is limited and aesthetics is the highest priority. Please note that the 3.5 is considered as a narrow platform and the 4.2 and 5.0 are considered as a regular platform. 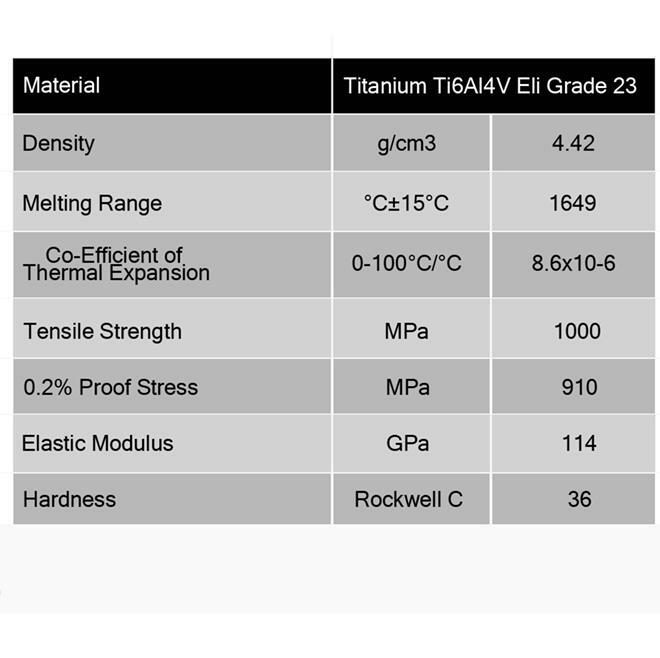 This Implant is made from a Titanium Grade 23 is a highly successful material for the fabrication of dental superstructures and implants, on account of its favorable combination of properties such as low specific weight, high strength to weight ratio, high modulus of elasticity, very high corrosion resistance and excellent general biocompatibility.